Those are darling, I love the matching outfits! Igot your email about recently giving birth, congratulations! I am so happy for your family! these are adorable Jennifer! i love that eyelet lace! Awww!! So cute!!! LOVE that little skirt! I would LOVE to have you share this at my link party thats still going on and maybe even become a new follower! Following you via facebook and GFC! This is so awesome! I would LOVE for you to stop in and share it in my Mommy Solutions linky. You have such a great ideas! Feel free to share others, too. Oh this just makes me wish I could sew! So cute! Happily following you via GFC. Those are so darn cute. You have a beautiful family and a a beautiful blog. I'm your newest follower. I would love it if you came to my new blog and if you like you could follow me too. I'm also hosting a Sunday link party you can share at. So cute. Thanks for sharing on Handmade Tuesdays. 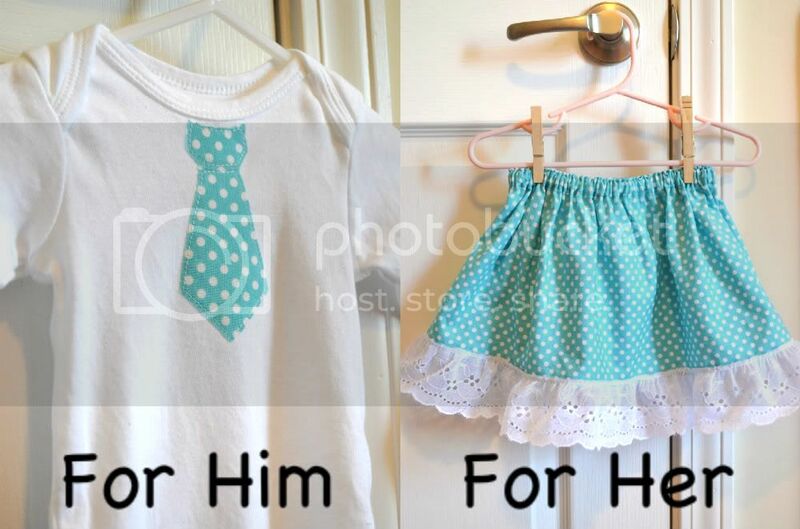 I love seeing how you can dress little girls and boys in coordinating ways! I love these, and love that color combo! I take advantage of coordinating my son and daughter as long as they'll let me...!! Oh my goodness how cute! I just love these little outfits, and love how they match! ADORABLE! Very cute outfits! They really look fantastic! I love this! My daughter wants one identical to it :D hopefully, mine it looks as good as yours does!